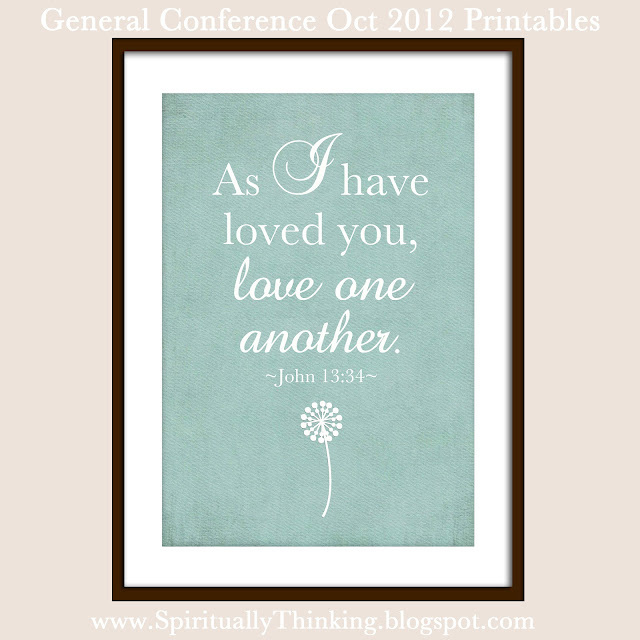 © All designs are copyrighted to © Sprinkled Joy, LLC. Download of prints does not transfer copyright. You may not forward, share, sell or distribute the file or print, and it is for personal or church use only. Linda K. Burton - text in the background is some of the wording from the talk. I love that you are so quick on these! What a great morning session! Thank you for helping me share these moment with my fellow pinners! Beautiful! 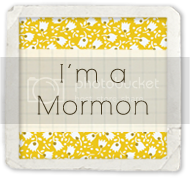 I sent your link to my family and my whole Relief Society! Beautiful work, lady! I hope you see blessings in your life as a (partial) result of you sharing your gift to bless others in their lives! You've blessed mine! Love these! 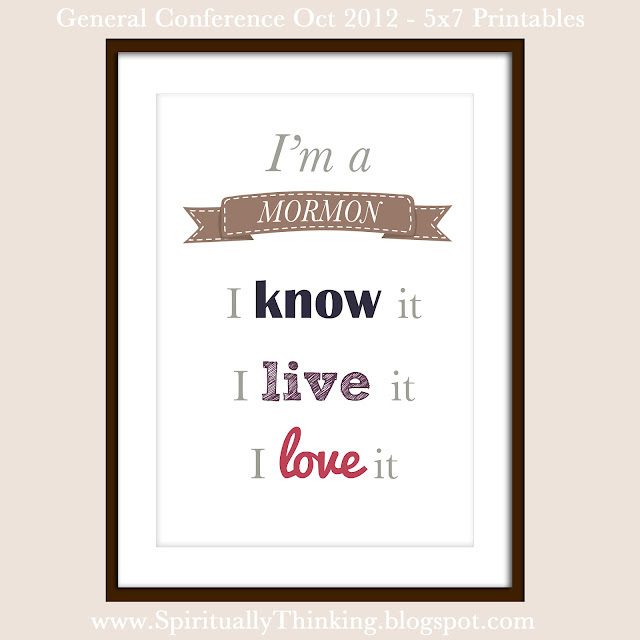 I added your "I'm a Mormon" printout to my blog (acknowledged where it came from too). Pinning away. Thank you, these are beautiful! Thank You! These are beautiful! Thank you so much for these wonderful quotes! Thank you for making this available to everyone. Thank you!!!! What an awesome job on this one. Thank you every so much for all you do. These quotes are so wonderful. I can see them for gifts. A trillion times THANK YOU! Theses are amazing. Thank you so much for putting all of these together. I love these! 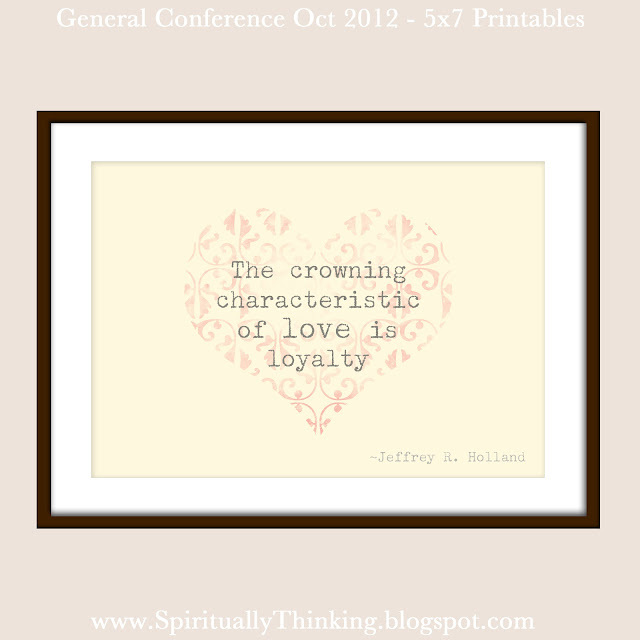 On the Elder Holland one, didn't he say "Do You Love Me" Will you make one like that? I've been searching all over Pintrest for one. 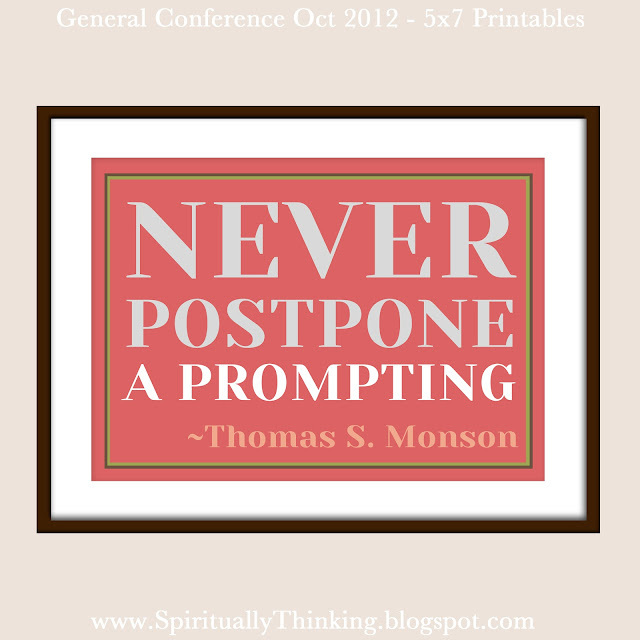 It was my favorite conference quote. Are these available in the small little ones like you did in April? I wanted to add them to my jar. I just adore these. You do such a great job. Is it possible that we can download the entire poster 11x13 size? I'd like to print the entire poster, frame it and put it on my kitchen island for everyone to see everyday! 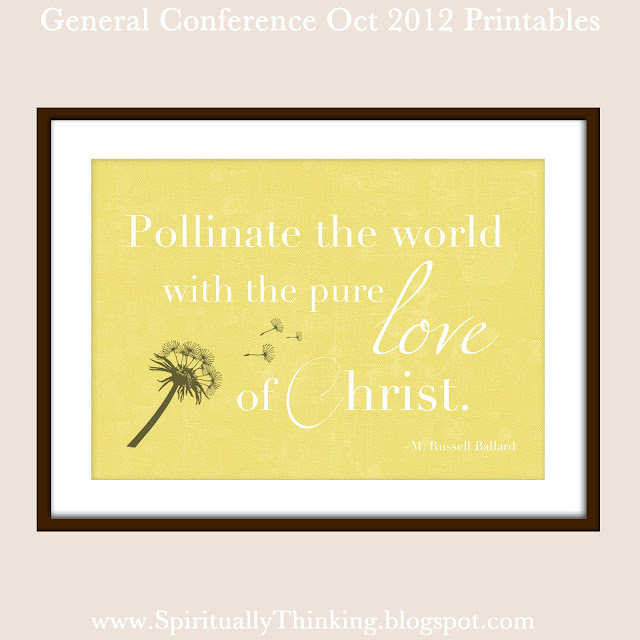 I can't pick just 1 great quote to print! Yes, PLEASE! A collage of the 20 different prints on one 11x14 image. Perfect for framing and keeping in sight for the next 6 months. 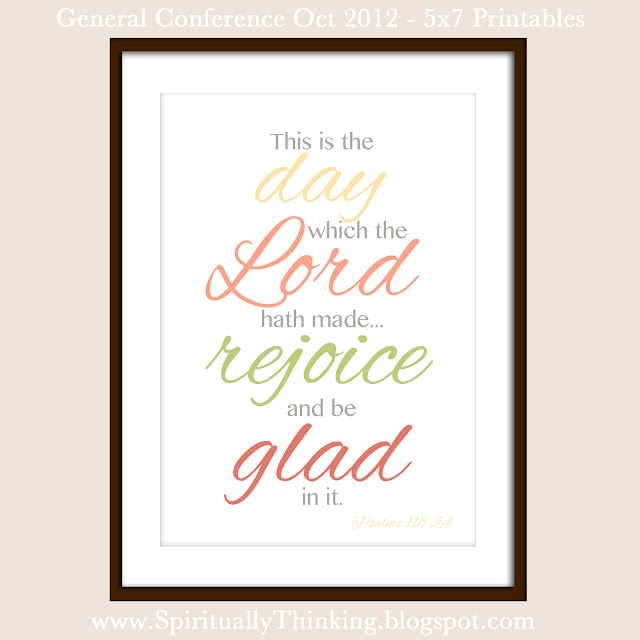 Every time you look at it there is another nugget of spiritual goodness! You are wonderful and it will be such a blessing to have this. It is appreciated more than you realize.Blessings to you and your family! I love these! I have 3 flip frames that I put the quotes in and change throughout the month. Thank you so much! 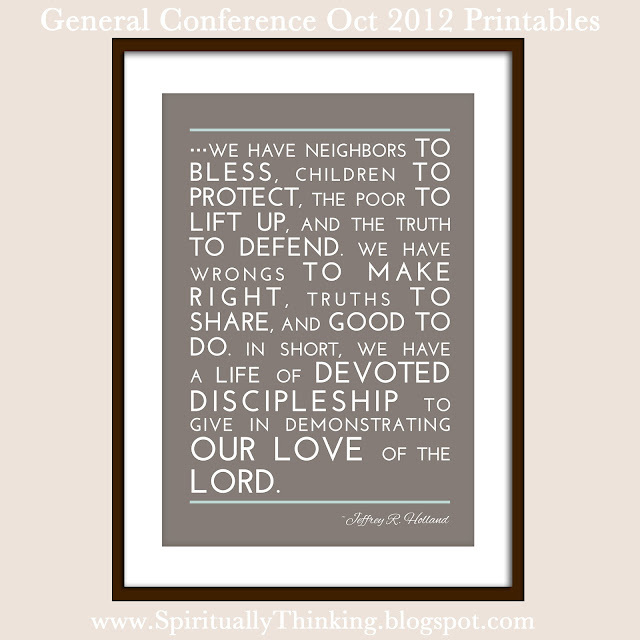 Another quote I just read from the priesthood session that I thought part of it might make a fun one is "I feel a certain sadness for those who do not grasp and appreciate the wonder and privilege of the priesthood. They are like passengers on an airplane who spend their time grumbling about the size of the packet of peanuts while they are soaring through the air, far above the clouds—something ancient kings would have given all they possessed to try and experience just once!" from Pres. Uchtdorf. I love these so much. You do beautiful work. I printed these at staples as VT handouts last spring. There were maybe 9 per page. 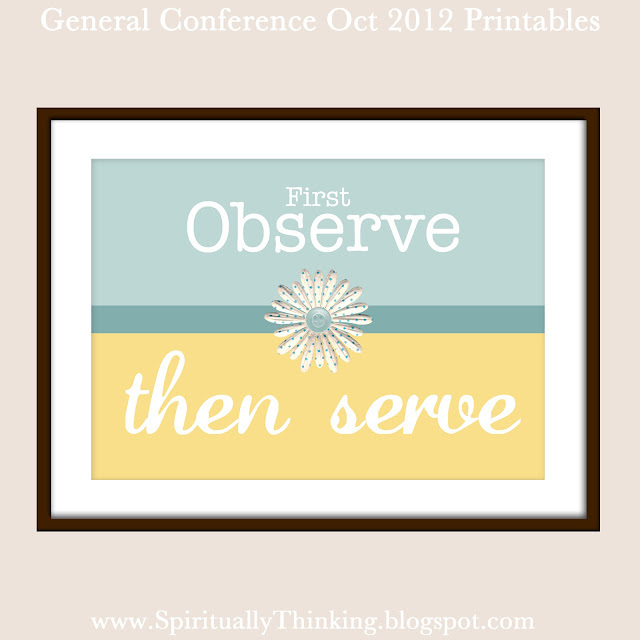 Not sure if you did that, or another website, but it was so great to have these quotes in a stylish graphical artwork. Thanks so much for sharing. I think I'll hang some up in my kitchen! 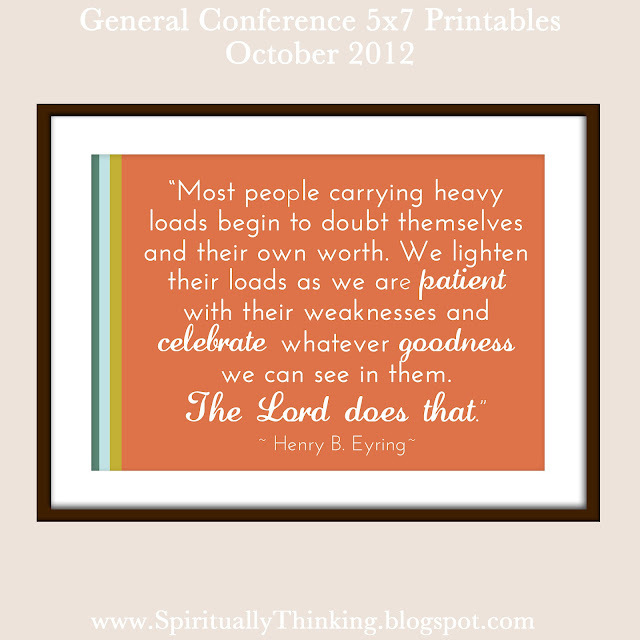 Are you going to do the same for the April 2013 GC? I've been doing the Conference Preserves and adding to them each conference. I'm thinking about having our YW do jars as well for a Personal Progress activity. Thank you so much! I work at a Seminary and I post a different quote each week. You did such a fantastic job. Thank you so much for sharing! So beautiful! I can't wait to make up a few and hang them in my home! 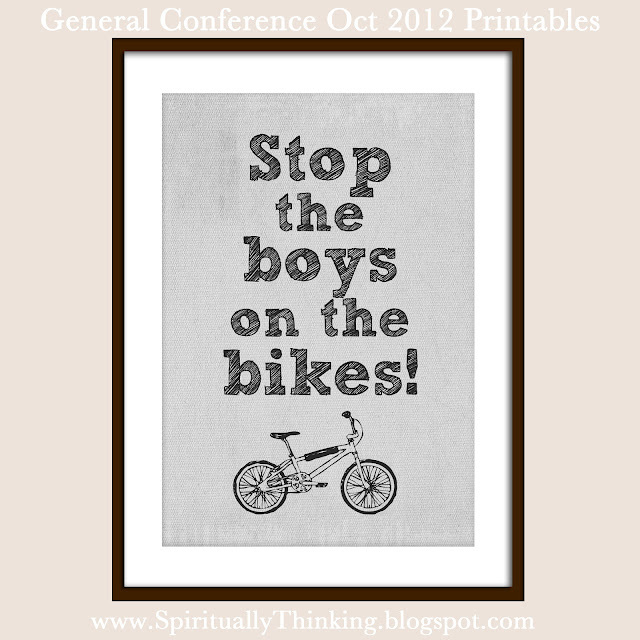 I'm putting the Missionary ones in my son's room ;-) Might I ask, where can you take them to print at 11x14? 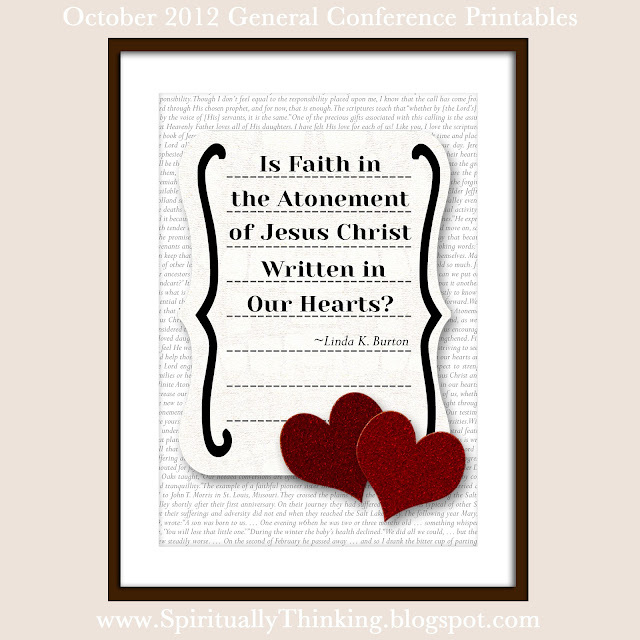 I would like to print Dieter F. Uchtdorf's "Of Regrets and Resolutions" quote for my mantle. Thanks for making these available. Is there a collage available with all the quotes on one paper? Possibly 11x14 size? I would love to be able to look at them all! Thank you for sharing your talent! I absolutely LOVE these...and so the sisters I visit teach! Thank you for sharing your talents and for making it so easy for me to have some really cool handouts month after month!!! I love the 11x14 print but it wouldn't download because it said you were out of bandwidth? What am I doing wrong? Thank you so much for sharing your talents! Hi Angela - not sure what that means either, maybe there were a lot of people trying to download at the same time…. if you still haven't had any luck feel free to email me at: sprinkledjoy@yahoo.com and I will email you the file directly. Thanks so much for these - I plan to hand some out for VT this week and display a lot of them around the home! I also got the out of bandwidth message so I'll email you and hopefully you'll be able to end it to me that way. 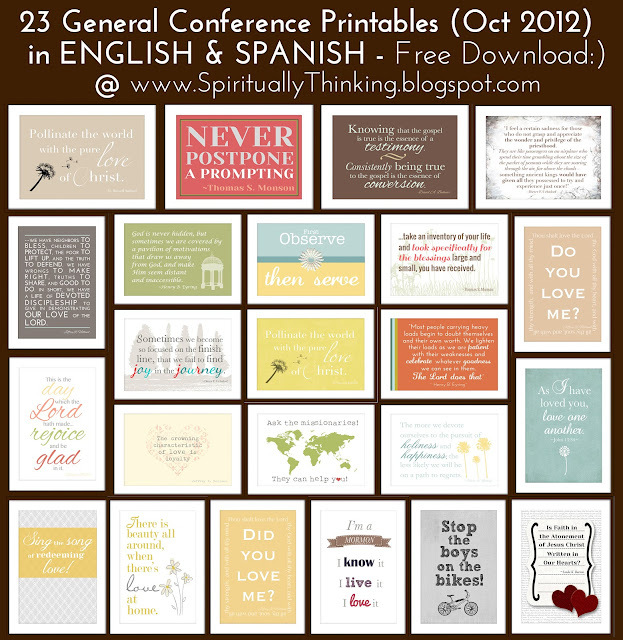 I couldn't wait to find these on your blog after conference! Thank you!! I love these! You did such a wonderful job :) What program did you make them in? These are wonderful! Thank you so much for making them available. I can't even tell you how much I LOVE these beatifully-created quotes. You have so much talent. Most amazing to me is the fact that you are offering these all for FREE! 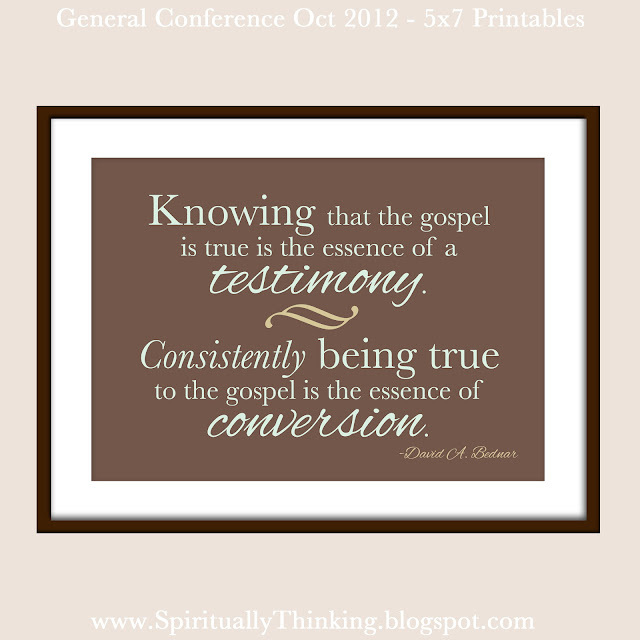 That is consecration. Thank you so much! 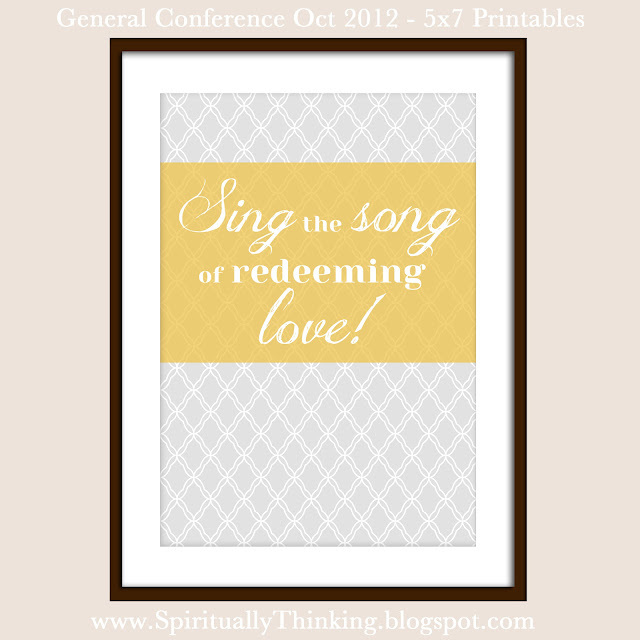 Are you going o be creating quotes from April 2013 conference?